Good morning sweet friends! Can I just gush and say that I found out last weeks Day of Giving Card is destined for Africa – waving hi to Carol! (My first to Africa although many to the UK, Spain, Canada and Australia). What a blessing that through our craft we reach out to friends all over the world. As I sit to my desk this morning someone is putting the final touches on a handmade card half the world away. What a joy! So today is Day of Giving Friday and a new card to give away (if you are new you can read about Day of Giving Friday on my FAQ List at #11). I heard a quote yesterday that I think applies to you all as people and crafters – “Talk to yourself like you talk to someone you love”. I heard it in a speech I was listening to and it was earth-shattering! We all put ourselves out there every time we create a card and sometimes were not so kind to ourselves. Make no mistake – there’s something special, beautiful and unique that each of you bring to your craft that is your personal signature. Be sure to explore that something special, and don’t compare it to anyone else – that’s your thing – it’s your blessing. I can’t tell you how much you all have touched my life – you’re my buddies and I know the beauty that lives in the gracious souls that stop here and that I chat with behind the scenes. Gush!! Hugs and have a super weekend. I hope to share more turndown gifts in the coming days! I think my style is having movement. I love different motion cards. Wow, all the way to Africa! That is exciting! Congratulations, Becca! I guess what I love about my card style is that the people who receive them just love them. They smile, study it, share it with others, ask questions about how it was made. It makes them happy, which also makes me happy! 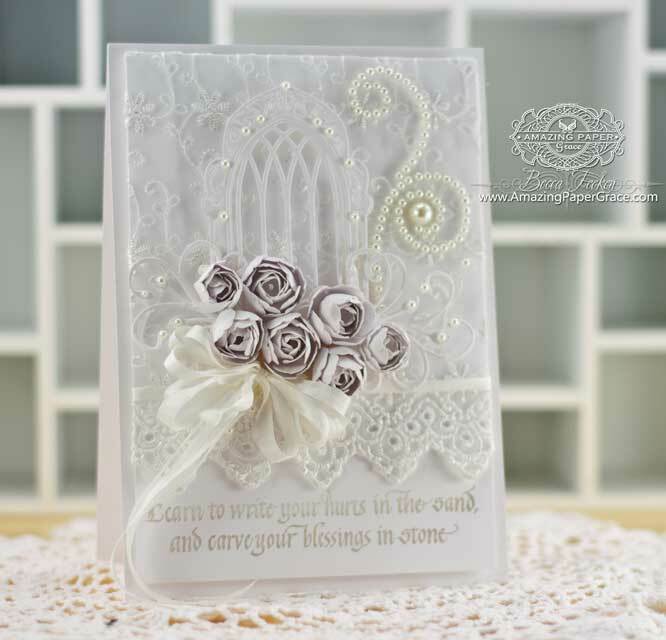 Gorgeous card… love the arched window. Plan to use this die on some Christmas cards. I don’t really know anything that is special to me. I guess that I always do at least 3 layers and usually add ribbon. I don’t feel that a card is finished without ribbon. Today is my birthday and I would love to receive this. I lean towards whimsical cards. I like fun designs. I don’t like gushy sentiments – just plain and simple. 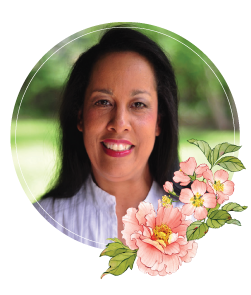 My cards aren’t very frilly – though I love to see cards that are embellished to the max. This card is beautiful. The design would make a great wedding card. Your card is beautiful and love the saying. I don’t know how you come up with so many ideas. Thank you for sharing as I think we are all learning through you. Wow, wow, wow, this is a stunning card, Becca. I keep changing my style but I suppose what I mostly like is an embossed background and letting the die cutting do the work! I like the color I can add with embellishments and paper. My first thought when I opened your feed, was WOW! This card is beautiful. You know, I never would have thought to talk to myself as if I love me :) That is so cool! About my personnel style…Hmmm! Love this card! Perfect for a wedding or christening. Trust that it will be copied ? I would say my style is clean and simple, but I love to shake it up for special events. I’m always seeing the flaw in a card, but when friends want to raid my stash or ask for a special card, it gives my soul a hug. I will print the verse for today and place it in a spot where I’ll see it daily. What I love about my style is that no matter whether I’m coloring with my copics or layering different papers or being brave with dies, it simply brings me joy and helps me relax. Wow and double Wow, this card is stunning, such beauty. It has brightened up a very dull and rainy day here in the UK. I Love my backgrounds on my cards and the colour combinations, I love to see what creation I can put together, not all work but most. Gorgeous card Becca. My own style makes me feel accomplished in a very selfish way. I feel proud and prouder when people smile and give nice comments about them. I have to admit to being a copy cat style pincher ,haha it depends on my mood and the person i am sending the card too ,eg my Granddaughter it has to be pink with plenty of sparkle , my friend something delicate and subtle . Your card is a little beauty today, it would go a treat on my shelf…. My style is simple and I think that is why I so admire your cards. I study them and sometimes try to make elegant cards like yours! You are an inspiration to us in many ways. Thank you! I don’t have a ‘signature style’ like you do. Wish I did. I cannot zero in on a single style. I am all over the place in what I like. It would be like asking me what my favorite color is and I could never change my answer. Just too many cool ones to pick from. Your style is right up towards the top, though! Your blog is the only one I consistently read and look at. I used to have many, but it was overwhelming, so when my email changed a year ago, I only kept a few subscriptions. I’m going to use a word that I don’t think I’ve used for one of your cards before. This one is exquisite…oh my! And I love, love, love that sentiment. And don’t think we didn’t notice you didn’t say a word about what you love about your style, Ms. because…ahem. We did…. Oh, Becca. This card is just breathtaking! How kind and loving of you to give it away. My card style is to pick just the right thought for the recipient, think of them, and the ideas just seem to come. I tend to a classic look – simple with touches of special embellishments but I also love to make fun cards that reflect who will be receiving them. My card style always includes dimension and texture. I think that is why I have always loved your cards Becca. I also always try to really personalize my cards based on the actual recipient. It takes me a little longer come up with a design, because of that little quirk I have. That is why I don’t make cards ahead of time very often. Your card today is so lovely. The first thing that came to mind for me was wedding. Think it would make a beautiful wedding card with just a few tweaks. Thanks for always sharing. I love this sentiment as well. WOW Becca this card is just tooo gorgeous. I love the white on white look and with the small amount of color in the flowers, it´s just perfect. Your “window card” is absolutely stunning! Thank you for the chance to receive it. Amazing Paper Grace ~ YOUR cards speak to my soul and to my style. I don’t often have a lot of time to make a card so am trying to enjoy more “clean and simple” cards. That IS Exciting news! Africa! Awesome!! Your cards are so beautiful just like your spirit. I’m not sure I have mastered a style of my own, but am learning all the time. I know I Adore and Love Victorian, Vintage Elegance and scenery. I guess what others say to me is that the are old fashion or antique looking. Hope your internet connection is back on target and that you have a wonderful weekend. We really hit the jackpot this week with so many beautiful cards. This one is definitely exquisite-I just love the lace. I have used lace as a border but haven’t used it to cover the card…but now I will! I’d have to say that I have an affinity for elegance & flourish but the things that have the most importance to me are attention to detail and quality. These are the things that are consistent. If these are present, sometimes I don’t do much. It may cost me more but it’s worth it! May you be blessed in equal measure by gushy moments and ones of calm serenity. Becca, I just wanted to tell you that you write as beautifully as you craft. God bless. What a beautiful card and all the lace, must try using lace on some of my cards.My style is mixing different crafts together(such as embroidery on paper or counted cross stitch) Look forward to more of your turn down gifts.You sure have followers all over the world good for you.Have a great weekend. My style is very eclectic as I make a card with a person in mind. Even if I am using a card designed by someone else, my card is for the person I am thinking of so there is always a fair amount of love put in to it. Oh Becca, what a spectacular card you are giving away today. Simply breathtaking….. I certainly am not an accomplished card-maker by any means so you could safely say I am still finding my way but thoroughly enjoying the journey!! Hmm – I like that somehow there is a little bit of me in every card, but more I love the fact that I can ‘taylor’ a card to a person – even when it is an order and I don’t have much information, somehow God helps me make a card that the client loves and thinks is so appropriate for the person they intend it for. Love the quote on your gorgeous card – it is such a truism. What a totally gorgeous card. Some lucky recipient is going to be blown away by it when it arrives! Just love that sentiment too! You really come up with some thought provoking questions andI had to puzzle over this one as I don’t think I have one particular style. I have to come up with a different card project every week for the group and have to vary what we do as members have different preferences and I try to cater for everyone’s tastes in turn. However, I do love the challenge of ‘constructing’ 3D cards or cards which have moving parts. Adding Africa to your list is awesome! Hello Becca the quotes you use are so meaningful if we really take time to think about them. We just need to try harder to put them into practice!!! Becca, Your comments brought to my mind, my best friend. We get together to make cards, about once a week. She puts a lot of stuff on her cards. Sometimes she needs to edit things. What I make are more minimal & I need to put more on my cards. Your cards are always so beautiful & so are you!! I’m trying to do more layers on my cards. I just enjoy creating them. Sometimes the ideas just buzz around in my head. They may come out the way I see them & other times they go in a different directions!! If I’m making a card specifically for someone, I love the way I try to incorporate things that they like. If I’m not sure, maybe a lot of little touches. Congratulations to Carol in Africa!!! They say it’s a small world!!! Talk to yourself like someone you love. I certainly talk to myself all the time. I also sing like no one is listening. I certainly try to speak to people how I would like to be spoken to!!! My style of card? I don’t know it depends on the recipient however I love your style of card they are just fantabidozy!!! What a beautiful card as always! I must confess that I haven’t made a card in a while. Hubby bought me a new embroidery machine so I have been using that a lot and learning new techniques. Eventually I will get back into making cards. Was thinking I needed to make a few Halloween cards after seeing some great poem ideas. You are so talented Becca and thanks for all your Friday shares! Becca, you card is GORGEOUS….one of your prettiest! I would be absolutely thrilled to be graced to receive and be able to treasure it!!! Thank you for the chance! What a lovely idea from a lovely woman–your Day of Giving is awesome. Oh Beeca, this card is absolutely exquisite! People tell me that there is always “something special” in my cards. I think that something special is LOVE. I love making cards and always create them with thoughts of the person receiving it in my heart. Hi Becca, Wow, your card is destined for Africa, and that lucky person will treasure it always. This card, as always, is stunning !! I love the arched window and those beautiful flowers are divine, the recipient of this card will be a very lucky ‘bunny’. I don’t really know what style my cards are, I know that I am my own worst critic haha, I like shabby chic, vintage, etc and find myself always adding glitter, I like to make a risen frame on my cards with die-cuts and then the focal image is lower than the frame, I love to put ‘angels’ with glittery wings on my cards, and I always put flowers and foliage on them. I love making ‘girlie’ cards, I’m not keen on making male cards haha. White on white is SO elegant! dear Becca, I love your cards and always find them so good to think about the lines you have on them,- something I like to make myself,but never put this sort on the blog. When I make a card with my whole heart,its quickly going to someone I love. Sorry here in Austria ist not so easy to get the Spellies you use on your cards,but sometimes we are lucky and get one or the other ! Oh, I love how this reminds me of my wedding dress! So pretty & feminine. Actually, you, Becca, have been instrumental in my finding “my style”. My first few years of card making were a real struggle. Although I am still learning, most of my cards, those first few years, were very amateurish. The combination of lack of knowledge, lack of inate talent, and lack of materials, made for a lot of cards that got thrown out . But i fell in love with your feminine, romantic cards, and your sincerity and faith. While I don’t get as fancy, and don’t have the resources in my craft room that you do, I would definitely call my style soft and romantic. Hi Becca stunning card today! We are without the internet so I am in a cafe .